The noise, the traffic, the heat, the dust of 600-year-old buildings and the exhaust of motor scooters and Pullman buses; the squadrons of German and Italian tourists dutifully following the high-held umbrella or long stemmed plastic rose; “too much ‘David’,” ditto the Madonnas with Child – so why does anyone venture to Florence, Italy anymore, much less return again and again? Noted author, Mary McCarthy enumerates each of these complaints and about one hundred more in the first ten pages of her narrative guide The Stones of Florence. The amazing thing is that she wrote the book forty years ago. The only difference today is that now hordes of Russian and Japanese tourists are also being herded through the narrow, sidewalkless streets, urged on by honking taxis and scooters. In the next 200 pages of her book, McCarthy eloquently answers the question “How can you stand it?” But I have my own personal cure: one that every visitor to the city can use. I escape to museums, which, though listed in almost every guidebook, are rarely visited by tourists, and never by tour groups. 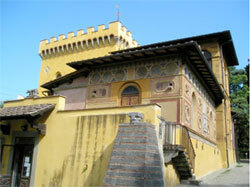 The Florence Zoological Museum or La Specola must be one of the most off beat museums in all of Europe. It will certainly appeal to most children and to any adult who possesses a whimsical, but slightly macabre, sense of humor. Tucked away on the third floor of a palazzo on Via Romana, just past the Palazzo Pitti, this small museum boasts room after well-organized room of stuffed or preserved mammals, mollusks, birds and reptiles — from the smallest tapeworm and hummingbird to a taxidermist’s ultimate accomplishment, a grinning hippopotamus. Although it may seem as if this was the collection of a nineteenth century colonial great white hunter, in reality the zoological exhibits came from the collection of Grand Duke Leopold of Lorraine who ruled Tuscany in the late 1700s, and from the vast seventeenth century Medici scientific collection. The most remarkable section of the museum begins after the room of stuffed crocodiles and giant turtles. The next nine rooms could be a scene out of Frankenstein or a dissection lab, although without the smell of formaldehyde. 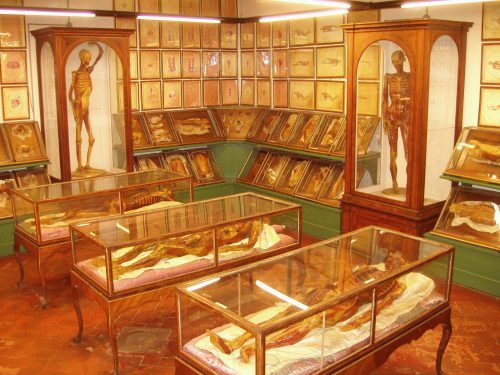 The floors are of ancient blood red polished tiles and the yellowing beige plastered walls compliment a collection of 1,500 anatomical models and body parts, created from colored wax. A school of ceroplastic (wax) modelers flourished at La Specola from 1775 to 1895. The wax models were used in medical schools for teaching aids. Napoleon visited the museum and ordered a set of the wax dissections for France. In 1850, the American dean of Louisiana’s medical college came to Florence to obtain copies for his school. Organized by physiological system, the highlights of the collection are six full sized male and female eviscerated figures lying in glass cases on long thread-bare silk pillows and three bug-eyed skeletal/musculature models standing on glass-enclosed pedestals. In the final room there are the four display boxes of gruesome allegorical scenes, created between 1691 and 1694 by wax modeler Gaetano Zumbo, entitled “The Plague”, “The Triumph of Time”, “The Corruption of the Body” and “The Effects of Syphilis.” In the same room with the Zumbo tableaus is “The Anatomy of the Male Head” – a wax model of the brain housed inside a real human skull. Those people with a passion for knights in shining armor will love the Stibbert Museum. However, those with a passion for almost anything else will also find reason to love the Stibbert museum. Frederick Stibbert, a British aristocrat (1838-1906), was an eccentric, eclectic packrat who traveled extensively, collecting paintings, furniture, bronzes, umbrellas, china and ceramic dishware and knickknacks, candle sticks, fans, and most every kind of antique. Stibbert’s main obsession, however, was for armor and weapons. He obtained thousands of suits of armor from Europe, the Middle East and Asia. The most impressive room displays a “cavalcade” where a procession of ten 16th century armored horsemen astride armored horses, twelve armed soldiers on foot, and four Islamic costumed horsemen appear to march under the gaze of a statue of St. George and the defeated dragon. Stibbert also collected costumes. The museum contains rare and important examples of European, Islamic, and Japanese dress, both military and civilian. One of most historically interesting costumes is the regal garb worn by Napoleon in 1805 when he was crowned Emperor of Italy, displayed among Stibbert’s extensive collection of Napoleonic artifacts and memorabilia. The museum comprises over sixty rooms of the historic villa that was the Stibbert home. The villa is fascinating in its own right; it is located in the foothills at the edge of Florence and is surrounded by one of the few original unspoiled Italianate gardens, with exotic plants and a small lake. The Stibbert Museum is frequently empty because it is not in the center of Florence, but it is easily reached by taking a taxi or the No. 4 city bus from the train station. Part of the charm of the Marino Marini Museum is the clean modern design and sense of spaciousness found inside the facade of the original building, a deconsecrated fourteenth century church. 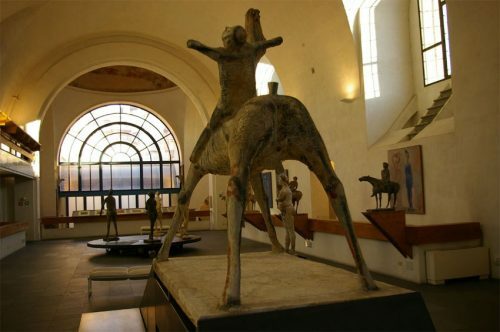 The museum, created in 1988, contains an extensive collection of painting, drawings and sculptures of contemporary Pistoian artist Marino Marini (1901-1980). The open expansive interior operates on many different levels with walkways, balconies, landings, platforms and stairs, providing the visitor with varied views of the paintings and large sculptures. There are also private spaces where pieces of sculpture are tucked away in smaller, subtly lit areas that give an intimate feel to the art. The Marino Marini Museum frequently hosts shows of other modern artists. The Workshop of Semi-Precious Stones, which specialized in Florentine mosaic work, or inlaid work with semi-precious stones (pietre dure), was founded in 1588 by Grand Duke Ferdinando I de’ Medici. The workshop’s original purpose was to coordinate the various craftsmen who were already working on the Chapel of the Princes in the church of San Lorenzo. The intricate work was also used to decorate cabinets, tabletops, and other smaller objet d’art with the depiction of flowers, fruit and birds, usually against a black background. The Medici used these items in the rooms of the Palazzo Pitti and as gifts to visiting dignitaries. In 1975, the workshop became a national restoration and conservation laboratory, school, library and archive, dedicated to the restoration of stone, marble, bronze, terracotta, and pietre dure. 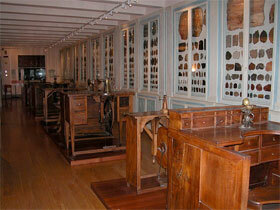 The museum, created in 1995, houses a superb arrangement showing the work and the history of the original workshop. The collection contains an extensive array of items — tables, cabinets, jewelry boxes, fireplaces, pictures, and jewelry — made with semi-precious stone inlay, scagliola (painted plaster imitating marble or pietre dure), as well as decorative painted shale and slate. A loft space within the museum has been converted into an educational area with original eighteenth and nineteenth century equipment and tools used for cutting and shaping stone, a graphic display of the procedures used in the various crafts, and a collection of cataloged mineral samples, mined in Tuscany and throughout the world. If Mary McCarthy were alive to see present day Florence she probably would be more cantankerous than ever, but she also would be secretly pleased to find that the Florentines continue to shoulder the burden of keeping Renaissance art and history alive and accessible in their beloved city. 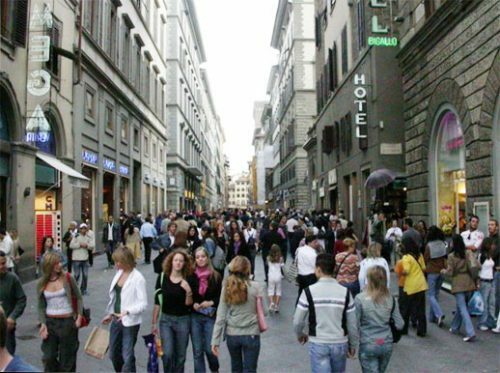 Over three million tourists visited Florence in the year 2002. By 2005, the number is expected to rise to five million. The wait in the ticket line of the Uffizi Gallery from June to October can be as long as five hours. It is comforting to know that there are so many pleasant, interesting museums where a visitor can escape the madding crowd for a few hours. Open: Weekdays & Sun. 9am – 1pm; Sat. 9am – 5pm; Closed: Wed. Nearby Café: Caffé Pitti; Piazza dei Pitti, 9: Tel. 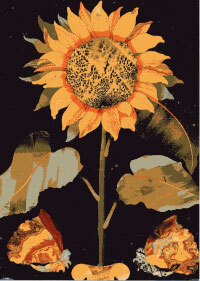 (055) 239-9863 ; Open everyday for lunch and dinner; Tuscan Cuisine with specialty dishes with truffles. Open: Mon. – Wed. 10am – 2pm; Fri. & Sat 10am – 6pm; Closed: Thu. Nearby Pizzeria: Pizzeria Spera, Via della Cernaia, 9/r; Tel. (055) 495-286 , Evening hours only; Closed Mon. (take-away pizza available); or take a picnic and dine in the gardens of the villa. Nearby Restaurant: Osteria di Giovanni, Via del Moro, 22; Tel. 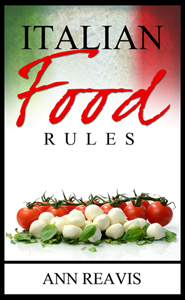 (055)284-897 ; Lunch & Dinner; Closed Tues.: Tuscan cuisine. Open: Daily 8:15-2pm; Thu. 8:15 – 7pm; Closed: Sun. Nearby Gelato: Carabé, Via Ricasoli, 60r; Closed: Mon. ; Gelato with lemons and pistachios from Sicily, famous for granita.